(LEE COUNTY/FT.MYERS TO CHARLOTTE HARBOR) – Since tropical storm Debbie (‘Debbie’) I have had five (5) charters, including a Tarpon charter last Monday, only to report it is very slow going. My fellow Charter Captains are all reporting the same. I took my Tarpon charter client, Mr. Frank Mellusi from New Jersey, out to Boca Grande Pass to see if the Tarpon had returned only to catch a nine foot (9’) Nurse Shark. It appears the Tarpon may have moved up towards Tampa, as I only spotted a few rolling on the strong out-going tide and my fellow captains not seeing many of them around the beaches or other passes. Moreover, ‘back country’ has not been producing satisfactorily as before ‘Debbie’. Baits have been hard to find and the shrimp are very small. However, I have been having most of my success in the early morning hours with artificial baits before the scorching heat. The Snook seem to be the easiest to locate and catch on the last half of the incoming tides, while the other species are hard to locate due to the higher water tides created by the full moon and aftermath of ‘Debbie”. However, the water is clearing up and as the water levels get back in place and the white bait returns, I feel the bite will improve. Anyone who wants to go fishing should get excited as the balance of the month of July should prove to be very successful. So get out there and have a good time’ as the winds are calm, making for a ‘great day on the water.’ If I may be of any assistance give me a call at 239-357-6829/239-471-7332 or email me at fishfacecharters@yahoo.com. 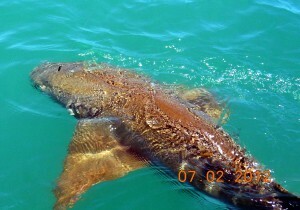 Check out my website at www.fishfacecharters.com. We keep telling you that Southwest Florida is just about the best place for boating in the U.S. To help prove that point, why not get out on the water and enjoy your 4th of July Fireworks from the water. The view is always the best from the water side. You get the fireworks themselves and usually some great reflections off the water as well. You don’t have to fight traffic and parking issues. And you don’t have to lug coolers and chairs all over the place. There are plenty of options for a great evening on the water. Here’s a list of waterfront fireworks we came up with. 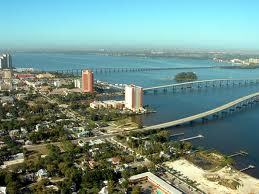 CAPE CORAL – Red, White & Boom is held at the foot of the Cape Coral Bridge on Cape Coral Parkway. Fireworks are scheduled to start around 9:30. FORT MYERS – Fort Myers Freedom Fest – Downtown at the River District. Block party starts at 6PM with fireworks at 9:30 off the Pavilion next to the boat ramp. Free dockage (space available) will be provided at the City Yacht Basin. 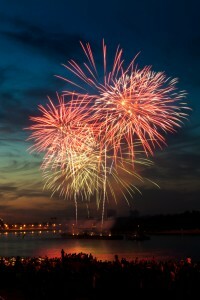 FORT MYERS BEACH – The Fireworks will commence from the Pier at about dusk. SANIBEL – Fireworks will be at the end of Bailey Road near the Causeway Bridge. Fireworks will begin at dusk. June 28, 2012 – The water has turned black in the canals along the river, which is to be expected, after days of pounding rain, & wind which is like using a big stick to stir all the muck and methane from the bottom. This can be a really good thing if it helps to get some of the muck from the bottom stirred into the water and hopefully flushed out of here. The tides today are starting at a .7 going up to a 1.7 then back down to a .2 this build up and strong outgoing flush is just what we need. The water should be much clearer tomorrow, and the bite should be good for the weekend. The gulf it is going to take a little longer to settle the muck out of the water, the waves pounded the shore lines and dragged tons of sand from where it was. Everything is going to change in the gulf, but by Sunday, if we do not get any strong winds between then & now, look for some great fishing. Gag Grouper opens this weekend the 1st of July and they have been on many of the near shore reefs. The best thing about Gags is they eat anything, Squid, frozen bait fish, Live fish, If you drop it they will eat. Inside the harbor I would check the reef at Alligator creek or at the Placida Trestle (live bait fish is going to be your best bet). If you are using dead bait be sure to bring chum, get the smell going, makes them hungry. Chumming for Gags inside is the way to make it happen. 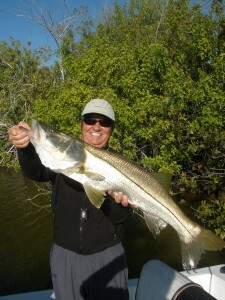 Snook are thick in all of the canals, and the spillways are on fire. Any color lure (as long as it’s white!) are making the Snook crazy. Cast & get a hit. This is something you need to try now! Read this and get it together, it won’t last long, a real barn burner. Go to a spillway where fresh water flows into the Saltwater. Start at the top with your lure, Cast until you catch a Bass. Then the easy part, start casting the base of the Dam and catch your Snook. Same spot. Same lure. How cool is that!! Like I said, this is a limited time offer, when the water quits flowing over the dams, it is over. Go out have some fun, enjoy getting back outside, Be safe when walking up to the spillways. (LEE COUNTY) Summer weather brings out some of the best fishing opportunities our areas from North Ft. Myers Beach to Boca Grande Pass have to offer. INSHORE: Snook are everywhere along the beaches and in the passes of Sanibel, Captiva, North Captiva and Cayo Costa Islands feeding on schools of glass minnows and scaled sardines. Spinning casters, Fly fishermen/women are walking and stalking the beaches for an opportunity to land one of the most sought after gamefish for the pure excitement of the fight and bragging rights they provide. Spinning casters using artificials should find success using suspending twitch baits, small white bucktail jigs and X-Raps to name a few. Fly-fishers have had success with numerous patterns such as small deceivers and Clauser minnows. Be sure your equipment is up to the task. Spinning casters will want 15-20 lb line test and they along with the Fly-fishers should consider a 40lb Fluorocarbon leader. Remember to stay back away from the water for best results. Mangrove Snappers are still around and can be found under about any mangrove structure. They love shrimps free-lined or under a cork so long as the bait lays close to the bottom or around the structure. Tarpon are here but the reported catches have been off as well as the bite. I recently spoke with Mr. Bob Thomas, President of the Cape Coral Tarpon Hunters Club and agreed that June was not as productive as we had hoped. 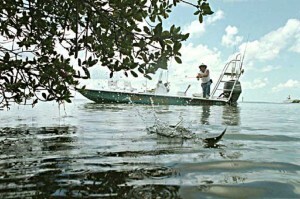 Attributed in part to the early warm waters of April and May and the seemingly early arrival of the Tarpon; the south and west winds have played havoc on the fishing. He reported that live bait fishermen/women are using Threadfins and Pinfish under a cork with the most success in the passes and around bridges. Dead bait fishermen and women are relying on catfish fillets, Spanish Mackerel chunks and ladyfish for the most part. Not a lot of Tarpon sightings of late in the Caloosahatche River. However, as the weeks progress the Tarpon should be showing up in the potholes of Pine Island Sound and Charlotte Harbor. When the weather cooperates, I find the Tarpon off of the beaches of Ft. Myers, Sanibel, Captiva and North Captiva in 10-30 feet of water as well as in the passes. Early morning and evenings with tide movement are the best times to target these fish. My bait of choice are live large Threadfins/Pilchards, Pinfish and Mullet under a cork or free-lining. I use lighter tackle than most of my fellow Cape Coral Tarpon Hunters. I use spinning tackle that can handle 50-65lb braid tipped with 60-80 lb test 6-8ft Fluorocarbon leaders and a 6/0-7/0 circle hook. Be prepared to catch your share of sharks as well. Depending on the weather and tide movements, fishermen and ladies working famous Boca Grande Pass are using techniques which include jigs as well as live baits (big threadfins, pilchards, crabs) with some success. Permit are closer to the shore line and are being found anywhere from 5-20 miles out on structure using live crabs, live shrimps and big chartreuse jigs tipped with cut bait and are weighing in anywhere from 15-30lbs. In closing, there are numerous other species that will be caught both In-shore and off-shore. Simply pick your day to go and be safe. There are a number of reliable weather sources to go to for planning your next fishing trip. I basically rely on wunderground.com for marine forecast and my planning purposes together with the local news weather channels. If I may be of assistance on your next trip or answer any questions about fishing or boating the beautiful and bountiful waters of SW Florida (Lee County) simply give me a call at 239-357-6829/239471-7332 or email me at fishfacecharters@yahoo.com. 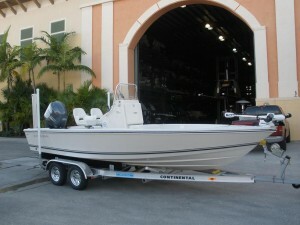 Check out my website at www.fishfacecharters.com. I am for hire on your vessel or mine. My rates are posted on the web-site or may call on the phone numbers listed above. I am USCG License, insured with years of fishing experience. Customer satisfaction and helping you know the area and understanding how to catch more big fish is what I am all about. S outhwest Florida has just about the finest boating waters you will find anywhere. We have beautiful, protected waters. Great places for cruising, sightseeing, fishing, swimming, anchoring or whatever you enjoy. And there are plenty of restaurants, bars and overnight dockage spots within a short cruise from wherever you are. As a long-time resident and avid boater, I’m looking forward to sharing with you my favorite places to go and things to do on the water. I’m sure that some who read these articles will be familiar with the destinations but may have forgotten just how nice they can be. 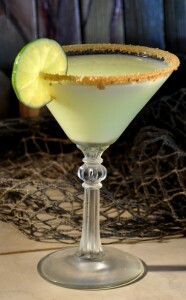 And for newcomers to our coast, maybe this will help you enjoy your boating experience even more. I thought we would start up the Caloosahatchee River a bit to the Ft Myers River District in the historic downtown area. By the way, in case you don’t know, the Caloosahatchee River is part of the Okeechobee Waterway System that connects the east and west coasts of Florida. That’s a really great trip if you feel a little more adventurous (I’ll cover that in another article). Anyway, the River District, an easy boat ride east (about 15 miles up the river from the Gulf of Mexico) brings you to the City of Ft Myers Yacht Basin. Dockmaster Leif Lustig and his friendly staff allow complimentary daytime dockage, if available, with an easy walk to downtown. Or they can accommodate an overnight stay, at reasonable rates, if you prefer. Call the Yacht Basin at 239-321-7080. Downtown Ft Myers has undergone a major facelift and revitalization over the past few years (with more on the way) and is proving to be a great boating destination. Once downtown, you can take advantage of a wide variety of restaurants (my favorite thing to do) historic structures and many on main and off main shops. There is even an interactive butterfly house (sounds dorky but is actually pretty neat with a café on site) , The Southwest Florida Museum of History and even the Art of the Olympians building. And of course the Edison Ford Estate is just a few blocks away. If you’ve never done that tour, it is well worth your time. The District has many planned events ranging from car and bike cruise-ins, to art and music walks, to outdoor concerts and is home to the Fort Myers Boat Show each November. You are guaranteed not to go away hungry, thirsty or in need of entertainment. And, if you need a place for the night, the Hotel Indigo is right in the heart of downtown. There are also both slip and hotel accommodations a short walk away at the Legacy Harbour Marina (239-461-0775). You can check on line at www.myriverdistrict.com for more details and event calendars. Get that boat out and go have fun! So you have decided that trailering your boat is no longer how you want to get your boat out on the water and you’ve selected a marina with inside or outside storage, and a forklift to launch your boat. Your boat is now going to get washed down and the engine(s) flushed, a great way to help keep her in shipshape. Here are some tips to maximize your marina experience. Always try to give the marina as much advance notice as possible when scheduling your boat launch. Showing up without a phone call requesting a launch can play havoc with everyone’s schedule – the marina’s and other boaters. An hour is typical, but each marina is different. Realize if you don’t call, there could be four or five boats ahead of you for launch. Arrive on time or let the marina know when you are running late. On busy days there can be limited room in the launch area and a couple of boats sitting for an extra hour can really clog up the basin. Be sure the marina has a set of keys or that you keep a key in the boat. Comes in handy when we need to move it, or when you forget your set! Take advantage of all of the marina’s services. For instance we will fill your boat with fuel, put ice and beverages in your cooler, test run your boat, etc. to make your day on the water hassle free and enjoyable. Most marinas provide some if not all of these services and I recommend that you use them. Nobody likes to show up and find a dead battery for instance. While we will loan you a new one to get out going, your still going to be waiting while we swap it out. Speaking of test runs, if you haven’t used your boat in month’s, call a week in advance and request a “back in service” check to see if your boat needs any mechanical attention before you arrive for a day on the water. This is particularly important if you didn’t have it “layed up” or “summarized” before it’s extended period of inactivity. We offer to run your boat on a monthly basis if you know you are not going to be using it for an extended period, this is the best way to keep all your systems operational. 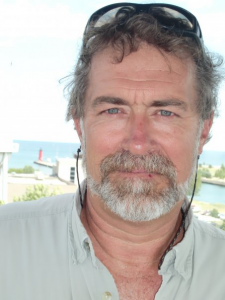 With over 30 years of Marine Industry experience, Ken is always happy to answer your questions. Email him at ken@kenstead.com. When it comes to boating, Gasparilla Marina has you covered! 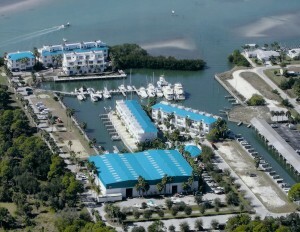 Gasparilla Marina is one of South West Florida’s finest deepwater marinas with a storage capacity of 1000+ boats. We offer traditional wet and dry storage or storage in our 2-acre fully enclosed facility, protecting your vessel from the elements. With 5 forklifts having up to a 42,000 lb capacity and 2 travel lifts handling up to 70-tons we can store and service most any size vessel. Other amenities include 24 hour security, on-site sales and service, fuel dock, bait shop, ships store, showers, laundry facilities and boat rentals. If you’re looking for a daytrip our onsite restaurant, Waterside Bar and Grill is the perfect location offering indoor and outdoor seating, entertainment, daily food and drink specials. Maybe you’d like to dock at the marina overnight, no worries our restaurant is open for breakfast, lunch and dinner from 6:30 am to 11 PM daily. Thousands of boaters from all over Florida have discovered the relaxed atmosphere and quality service at Gasparilla Marina. Since we are located directly on a deep water channel just off Boca Grande, you avoid those frustrating no-wake zones. Customers enjoy easy, high speed access to Charlotte Harbor, the Intercoastal Waterway, the world famous Boca Grande Pass, and everything that lies beyond. Gasparilla Marina is a first class, full service marina just minutes from the intercoastal, Gulf of Mexico and world famous Boca Grande Pass. Stop by and ask for a tour! Golden Boat Lifts is committed to manufacturing the “Finest Boat Lifts in the World.” With over 30 years of experience in all phases of boat lift manufacturing, service and consulting we provide a full range of lift systems customized for powerboats, pontoon boats, jet boats, wave runners, sailboats, and motor yachts of all types. We offer lifts to handle sizes from 1,500lbs to 250,000lbs. Each boat lift cradle is engineered and designed to fit the boat manufacturer’s recommended bunk placement. Golden’s warranty is the best in the industry, 2 years bumper to bumper and 15 years on the structure for the 4, 6 and 8 post lifts and the GatorvatorTM. Golden Boat Lifts has the finest drive unit ever introduced for a boat lift system. The “SEA-Drive” enclosed gear system is packed with grease, which means it is maintenance free and eliminates the chance of failure due to slipping belts or broken chains. The gear box was designed exclusively for Golden Boat Lifts. It has a rating of 8,000 inch pounds of torque which far exceeds 4,000 inch pounds of torque that the closest rival’s gearbox can produce. The “SEA-Drive” comes with a 10 Year manufacturer’s warranty on gears, seals and housing and a 2 Year Warranty on electrical components. 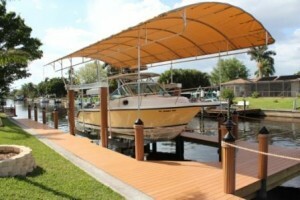 Golden also offers boat lift covers. The Boat Lift Cover in a BoxTM protects your boat against Sun UV & Rain. It comes in variable sizes and colors. Contact us for more details!